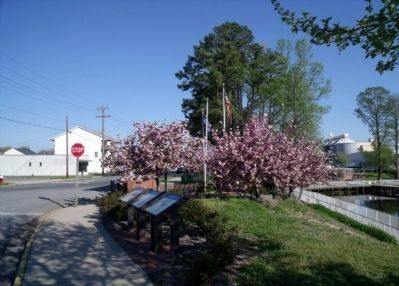 Before the Civil War erupted, Franklin became a regional transportation and commercial center for the Blackwater-Chowan River basin because the seaboard and Roanoke Railroad connected with steamship lines here. 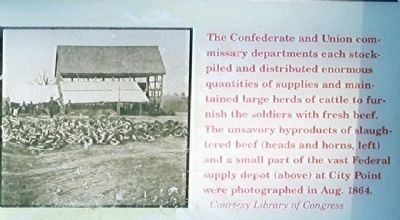 When the war began, the town immediately became a Confederate commissary depot for millions of pounds of food and fodder en route to soldiers in the field. Produce from eastern North Carolina and Virginia farms arrived on boat and wagon to be transported via the Seaboard and Roanoke Railroad to the Garysburg, North Carolina, junction with the Petersburg Railroad. This roundabout route became a lifeline for the Confederacy. Vast amounts of supplies were brought here from east of the Blackwater River during Confederate Gen. James Longstreet’s April 1863 Suffolk Campaign. “We just swim in bacon,” one Texas soldier recounted, “and all of the time we have an immense wagon train hauling out bacon, corn, wheat, flour and great droves of beeves.” Most of the supplies were sent on to Richmond and helped sustain Gen. Robert E. Lee’s army in 1863. 2. Franklin Virginia Civil War Trails Markers (facing north). the Blackwater-Chowan corridor provided the Confederacy as much as ten million pounds of bacon and pork. A brisk trade also flourished along the Blackwater between Confederate and Union soldiers, in which Southern cotton and tobacco were traded for much-needed clothing, coffee, and sugar. Military officials on both sides overlooked this trade. Franklin’s war ended in April 1865 when Union troops occupied Southampton County. When the town’s residents returned, they found warehouses, bridges, rail lines, and houses destroyed but found the wherewithal to rebuild Franklin. Erected by Virginia Civil War Trails. Marker series. This marker is included in the Virginia Civil War Trails marker series. Location. 36° 40.461′ N, 76° 55.166′ W. Marker is in Franklin, Virginia. Marker is at the intersection of South Main Street and South Street, on the left when traveling south on South Main Street. Touch for map. Marker is in this post office area: Franklin VA 23851, United States of America. Touch for directions. (a few steps from this marker); War Comes to the Blackwater (a few steps from this marker); "Can't Is Not in the Camp's Vocabulary" (a few steps from this marker); The Age of Gasoline (a few steps from this marker); Recovery and Progress (a few steps from this marker). Touch for a list and map of all markers in Franklin. More. 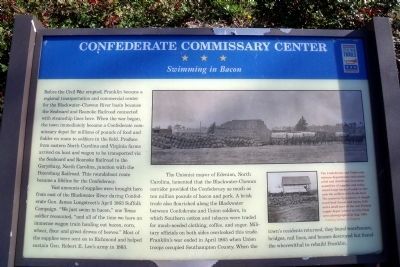 Search the internet for Confederate Commissary Center. Credits. This page was last revised on June 16, 2016. This page originally submitted on April 20, 2009, by Bernard Fisher of Mechanicsville, Virginia. This page has been viewed 1,442 times since then and 11 times this year. Photos: 1, 2. submitted on April 20, 2009, by Bernard Fisher of Mechanicsville, Virginia. 3, 4. submitted on November 13, 2011, by Mike Stroud of Bluffton, South Carolina.